John Martin's powerlifting father had him in the gym before he had a chance to be misled by anti-fitness. Now that his father has passed, John lives the fit life to honor his first mentor. Military fitness is no joke. The men and women in uniform work hard to prepare for life-and-death situations. Many servicemen stand on the frontlines taking fire, but many others work with computers, managing support systems, troubleshooting for operations to support their brothers and sisters in arms. John Martin is driven by a lifelong obsession with fitness, ignited by his parents. The Martin family has been serving the United States for generations, and John supports combat troops via modern technology. The world is changing, but some things will always remain important in war. Soldiers must be at their strongest, physically and mentally. John was born Army. He lives Army strong. I was basically raised in a gym. My dad, John Sr., actually met my mom in the gym. My dad was a professional powerlifter, and my mom competed in many bodybuilding contests. So as a child, my dad would often bring me to the gym with him. I remember going to powerlifting contests with my family and helping him put his suit on. But training didn&apos;t start for me until I went to college to play basketball. I was a skinny kid playing against grown men so I needed to complement my speed with size. It wasn&apos;t until I got recruited by Polytechnic Institute of NYU and met my strength and conditioning coach that I fell in love with the iron. He taught me how to work out and the fundamentals of lifting. Being deployed gave me the time and the inspiration to continue to build and to learn. I constantly learn and learn each day, and watching Pumping Iron has definitely helped motivate me as well. My dad passed away in 2010, and every time I train I think of him and how proud he would be of me, sharing the same love we have for the gym and strength. When I lost my dad, I had a lot on my plate. I had just turned 21 years old a couple weeks earlier, and I had to grow up quick and make choices. My grandparents were veterans, and I have two elder siblings, one who&apos;s retired and one who is currently still serving. I have seen the discipline and how much better the military had made them. My mom and my fiance, Madelyn, were my driving forces to really commit. They both believed in me, believed that the military can give me the path I desired, and it also helped that my fiance and I decided to do it together. "If you want something bad enough or want a certain look bad enough, you need to have the willpower and toughness to achieve it." I would say doing things that don&apos;t make sense to me. You find yourself questioning things a lot more, but it also builds mental toughness, because at the end of the day you have to do it anyway. 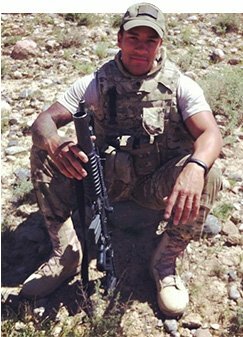 On my first deployment to Afghanistan, it helped me to focus on not just exercise, but the importance of nutrition. I feel like most people want to look a certain way or have a particular goal in mind but don&apos;t want to cut back or give up eating certain things. Also I&apos;ve learned that if you want something bad enough or want a certain look bad enough, you need to have the willpower and toughness to achieve it. There&apos;s no room for egos in fitness and I&apos;ve seen a lot of that. I most likely would have finished my degree and pursued a career in computer science or law enforcement. As a (25b) Information Technology Specialist I&apos;m constantly learning about different aspects of computers, networks, troubleshooting. These are skills that companies look for. The world is changing constantly with new software, electronics, so the demand for IT specialists is great. I&apos;ve grown up Army and I only know Army. I believe fitness in any military branch is what you make it. Some people settle for just the bare minimum and some people choose to exceed the physical standards put on us. I think fitness is one of the few truly universal things. "You learn not to take time with loved ones for granted and you learn to appreciate them more." The biggest obstacle is being away from home, from my family and my fiance. It is tough at times, when my family is always there and then I have to leave for deployment or training. It&apos;s tough, but it is also a blessing because I learn not to take time with loved ones for granted and I learn to appreciate them more. You have to find a balance. It&apos;s very important. I like to challenge myself each time to see how high I can score or how fast I can run. I feel like for me, if I score anything short of a perfect score (300) then I didn&apos;t prepare myself or didn&apos;t push myself hard. A PT test pushes you to your limits. Fitness itself takes sacrifice. To wake up earlier than others to work out, to fight temptation for food that is not good for you but tastes great, to push yourself even when you&apos;re tired or just don&apos;t feel like it—all those things are sacrifices you have to make to reach your fitness goals. Just like in the military, it&apos;s a mental challenge that requires you to be tough, unbreakable, and keep your bearing no matter what obstacle is thrown at you, be it a delicious slice of pizza or having to leave your family for a deployment. What&apos;s the story with your tattoos? My tattoos are a part of my identity. The tattoos in my sleeve describe different moments in my life, from my love of basketball to the death of my dad, and even some harsh breakups. Each tattoo holds a significant meaning to me. 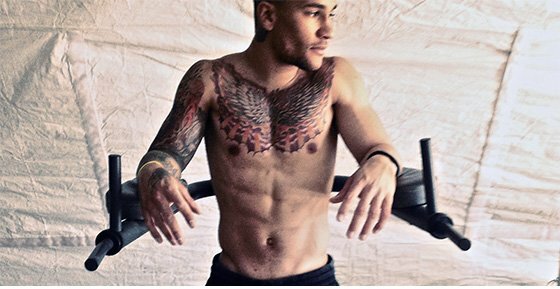 I have a phoenix on my chest that I got just after I finished AIT, which symbolizes a changed man. I also have a leg sleeve with a Japanese meaning to it; the tattoos symbolize good luck and fortune. 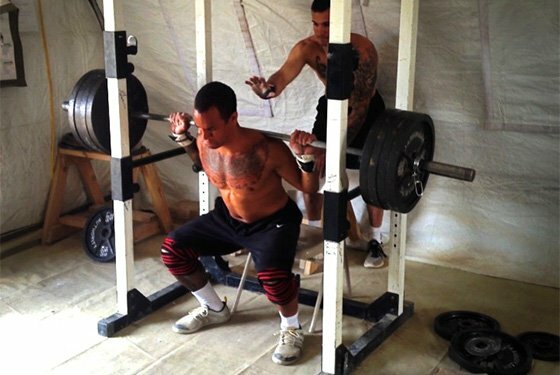 Makeshift weight rooms exists on most military bases around the globe. It is a healthy distraction from the rigors of war. How do you handle the rigors of working in a war zone? How does it affect you physically or mentally? The hardest part is just being away from my loved ones. I miss home and I miss the routine of being home. Family and friends are my biggest support system. Being away from my support system forces me to adjust, and then I build camaraderie among my team and the people around me who go through the same exact thing. The gym helps me relieve stress, and speaking to people back home helps me mentally. The friendships I make here help. I&apos;m not alone. You maintain network communications between units. How important is communication in the military? As with anywhere in the world, no communication means nothing gets done. In our case, being able to communicate and keeping each other updated constantly on the mission that mission will be hard to complete. It is a vital part of any military operation. How have technological advances helped the modern military function? It has made things easier, faster, and more efficient. It helps make the soldier&apos;s life easier and a bit less stressful when some of the workload can be shared with technology. To create a deficit, stand on a small platform with the weight resting normally on the floor. Cluster Set Technique: Perform a single rep, rest 10-20 seconds, perform a second rep, rest 10-20 seconds, and continue in this fashion until you reach the end of the set. I just want to continue to train hard and get results. There was a time I wanted to be a fitness model, but my plans changed. I really feel like I can help motivate others achieve their goals the same way I&apos;ve achieved mine. I am studying to become a certified personal trainer, and I want to ultimately finish school and get my NSCA certification. I believe I can help young athletes perform and be in great shape for their sport. I want to inspire people like my parents and my strength coach inspired me. I also want to compete in at least one powerlifting and bodybuilding show as a tribute to my late dad and a tribute to my mom, because they&apos;re my inspiration. I think it would be a cool thing. I think training hard and eating clean will eventually pay off. Bodybuilding helps me, because of the stressful conditions I am in; it&apos;s a way to relax. To quote Henry Rollins "I have found the iron to be my greatest friend. It never freaks out on me, never runs. Friends may come and go. But 200 pounds is always 200 pounds." Bodybuilding motivates me not just to be in shape or look good, but it keeps me focus throughout the day and keeps me motivated. Frank Zane, Arnold Schwarzenegger, Franco Columbu, Shawn Ray, and Rich Gaspari. I believe everybody should learn technique and form first. Many people lift incorrectly based on ego. In order to get the most out of your training, lift smart, learn the movements, and get comfortable. Stay motivated and strive to do your personal best in each workout.